In French, éclair means lightning. Why? The Chamber's dictionary has an apt definition - 'a cake, long in shape but short in duration'. Bite into one and you will know exactly how true that is. 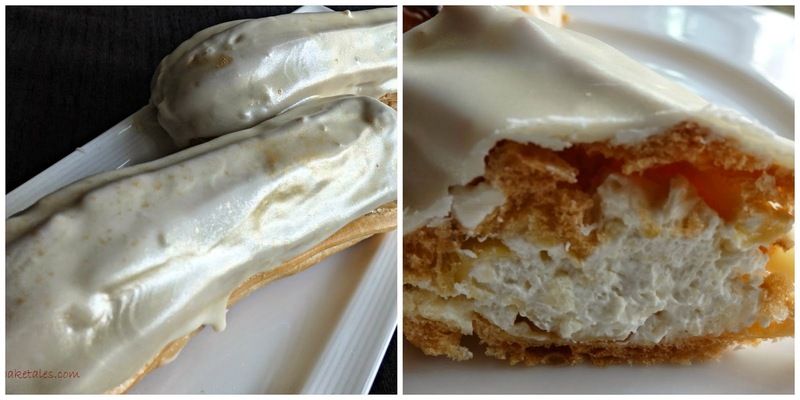 Who hasn't heard of éclairs? Choux dough piped into an oblong and baked. When cooled, it is filled with a delicious pastry cream and finished with a fondant topping or chocolate glaze. Of course, Paris is the birthplace of this wonderfully decadent bit of confection. 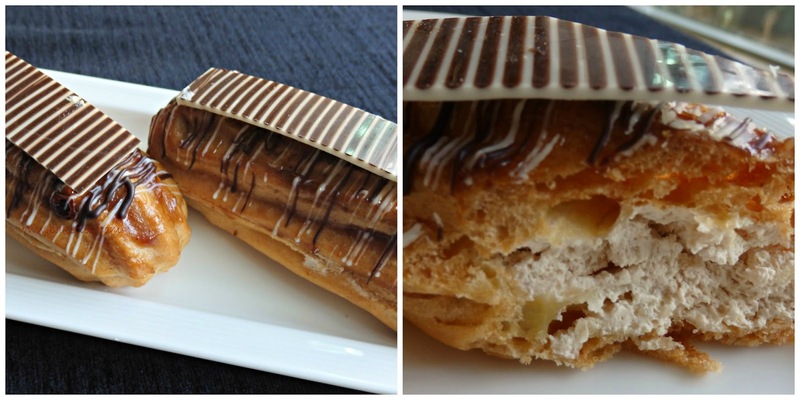 Le Royal Meridien at Guindy has recently launched its global éclair festival. Each of their properties has introduced a speciality line of 3 éclairs, using ingredients which define that particular city. Here's a quick question - what's an ingredient that Chennai (or Madras) is synonymous with? If you said filter coffee, give yourself a pat on the back! I spent half an hour talking to Le Meridien's pastry chef where I learnt that they bake the 3 signature speciality flavours and 10 classic flavours every day. Classic flavours include strawberry mascapone, fig and cashew, amaretto orange and of course, chocolate truffle. He took me through the making of the choux shells and the fillings. So what are the 3 signature flavours that represent Chennai? Filter coffee in Salted Caramel and Filter Coffee Éclair, khoa in Golden Éclair and tamarind in Hazelnut Tamarind Éclair. 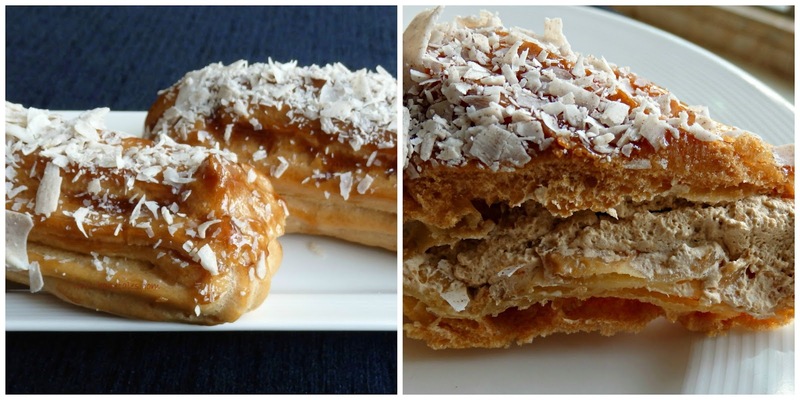 The Salted Caramel and Filter Coffee Éclair had shavings of white chocolate sprinkled over the top. Quite simply, I loved it. The éclairs were beautifully piped and baked to an even colour. The filling was luscious and substantial, and the combination of caramel and coffee sang in perfect harmony. Not surprisingly, this is the top selling flavour. The second one is appropriately called Golden Éclair. 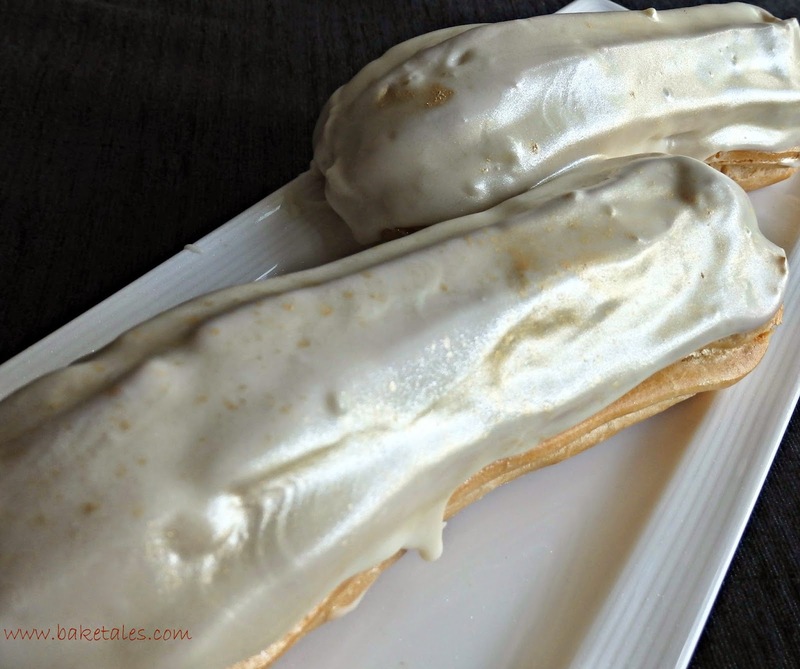 The éclair is coated in white chocolate and brushed with golden luster dust. The filling is a creamy mixture of khoa and saffron. It was a play of textures- a hard chocolate top and the soft cream, saffron and khoa filling. The flavour of saffron was almost imperceptible but biting into the éclair, it tasted mildly like a milk sweet. The richness of the filling perfectly complemented the crisp, chocolaty pastry shell. The third was the most intriguing. Lines of dark and white chocolate piped over the éclair and presented with a chocolate tile over the top, there was no hint whatsoever as to what lay within. At first bite, the tamarind flavour in the Hazelnut Tamarind Éclair stood out, then the hazelnut took over. Both are dominant flavours and the combination grows on you as you progress with the eating- fusion at its best. I found the choux pastry shells a little too thick. It would be nice if they could be made a bit thinner so one gets to enjoy the flavour of the fillings. As for the fillings themselves, innovation deserves top scores. All 3 flavours certainly do represent Chennai. These éclairs will be available every day. They are quite substantial and cost about 120/ each. Pick them up at Le Gourmandise, the pastry counter at Le Meridien or try them at the buffet at Cilantro, the all day dining restaurant.